Robert Spargo, a 39 year old Cornish miner from Baldhu near Truro, emigrated to SA in 1853 on the ship ‘Magdalena’, embarking from Southampton. He was accompanied by his wife Grace (nee Bray) and five daughters: Mary Jane (b 1839), Eliza Ann (b 1842), Rebecca Bray (b 1845), Caroline (b 1850) and Louisa (b c 1852). At the time, boys nine or older were allowed to work; daughters under 14 were not. The Spargos had many mouths to feed and presumably limited income for doing so. Miners were needed in the new Province and the family decided to emigrate. Unfortunately, their fourteen-year old daughter Grace died at sea on the voyage out. Within a few months of the family's arrival in Willunga, another daughter Elizabeth was born but, sadly, was found dead in bed three weeks later. She was probably buried at Willunga but there is no record of this. Then in 1855 another child was born - this was George, their first and only son! Two daughters followed - Elizabeth who died aged 4 days old in 1858, then Emily (b 1859) who later married George Melville. The family were very poor. As soon they were old enough, the daughters took up casual employment or ‘live-in’ positions with local families as servants or housemaids. Daughter Eliza was employed as a nursemaid by Edward and Mary Loud at their Willunga property called ‘Thornaville’. Tragically she was drowned in a waterhole in the summer of 1865, when only 23. She had arranged a special outing with the Loud’s two children and her brother George, who was celebrating his tenth birthday. They went to a lovely gully in the hills just west of Willunga, known to the Aboriginal people as Wykera Wonjerilla, which contained an attractive cooling-off spot which the new settlers called “The Carey Hole’. Eliza was reportedly drowned while saving the life of her young mistress (Miss Loud). Eliza was buried in the Anglican Cemetery in Willunga, on Aldinga Road. Robert Spargo’s health was not good and Eliza’s accidental death would not have helped. In 1867 he was admitted to the Adelaide Hospital with emphysema. He struggled on, but two years later in 1869 he was forced to ask the Council to provide rations for himself and his family, which they did. Robert Spargo died in 1871, aged only 57. He too was buried in St. Stephens Anglican Cemetery on Aldinga Road. His wife Grace stayed in the cottage until 1883 when she moved to Adelaide to be near her son George and his family. She died in 1894, aged 75 years and was buried in the West Terrace Cemetery in Adelaide. 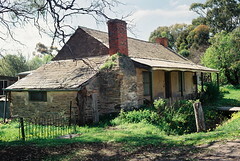 A Riparian rights dispute with Willunga Council embellishes Grace Spargo's place in local history. Vaudrey G. C. Water under the bridge: The story of Robert and Grace Spargo 1991..
Do you remember Spargo Family ? Then Join up and add your memory here.